I had a conversation last week with a Excel power user who wanted to combine data he got delivered from his sales department in a csv file and data in one xlsx file with the target of the sales. He had difficulty understanding how he can combine these two in PowerPivot. Although he had seen some demo’s and read some blog posts about fact tables, dimension tables and relationships and he still was unable to get these 2 sources combined. In this blog post we are going to combine two fact table by creating a relationship and take a look at how relationships work. 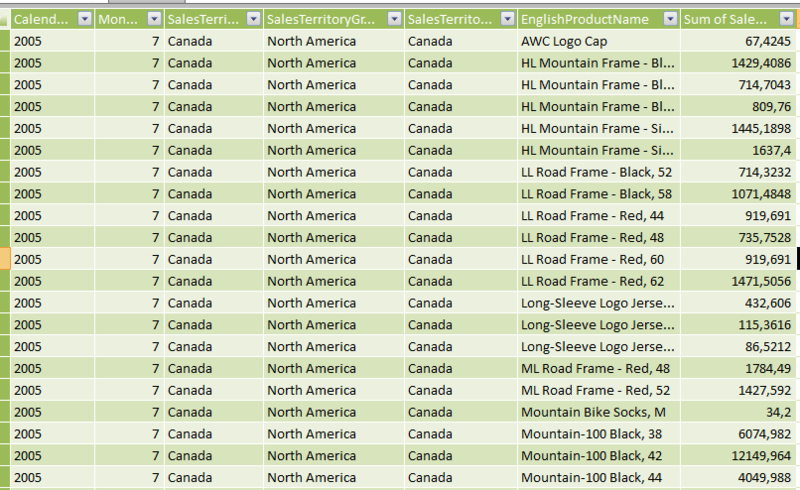 The purpose is to create a report where we can see the number of sales by month by country next to the target values. So we now are able to create a report using our sales we imported. But to get values of the two different tables in one pivottable we have to relate the two to each other, PowerPivot warns us that we should create a relationship, but is unable to detect one for us. We have to remember we are building an ad hoc report with data that doesn’t come from an ETL, we have gathered some data somewhere and all we need is a quick answer, not to build a Bi application that we have to use for all kinds of analytics in the next few year. In this case we would select our facttable as “table” in the relationshipscreen and we select the country table to lookup the country value in. This would make it possible to show the countryname instead of the countrycode at our pivottable. Ok back to our example, we have two tables where we would like to lookup the target value from the “target” table next to each value from the “fact” table. To be able to lookup a value from a table you have to make sure PowerPivot can only find one unique value at the lookup table for each row in the fact table. When we would have two countrynames for FR PowerPivot wouldn’t know what to put in the pivottable as the value belonging to FR. PowerPivot has a check to make sure you do this correctly, you will get a “The relationship cannot be created because each column contains duplicate values. Select at least one column that contains only unique values.” error when you try to create this relationship. We need to find a unique value in the lookup to table to relate to our fact table. Now we are able to combine the two values in one report. Powerpivot will automatically sum all the values from the two tables by looking up all the values in the lookup table belonging to the data from the fact table that is selected in this pivottable. The last thing to keep in mind is when we would select a productname from our fact table in our pivottable we are unable to lookup a value from the target table since the product isn´t in the “target” table. Previous PostMy PowerPivot CTP3 is expired, what to do. Could you please tell me know what’s your difference measure calculation? You have not one but 2 start-schema, or a galaxy, correct? If true, I think that PowerPivot should automatically detect and link these to fact tables that has conformed dimensions in common. I only believe in Power Pivot if the source is a DW or OLAP cube. very interesting post and blog. Hi @PedroCgd , thats right i have 2 fact tables so two star schema’s. I agree powerpivot could detect this but i understand why this is pretty hard to do, you have to be really aware what the lowest degree of data is and then what also could be connected to another table. The main problem is that PowerPivot currently doesn’t support multiple keys. When they add this it would be more easy for them to implement the detection you suggest. Clear and crisp, wish I had landed up here before figuring out everything on my own 🙁 However just to play devil’s advocate, why go through all the trouble. Wouldn’t it make more sense to prepare a key, do a vlookup and pivot the output. Whats the huge benefit if you need to build the schemas / keys yourself. Honestly, am not convinced of letting my users start building stuff on their own. When the level of the data in each on the sources not being at the same level, I can see so much going all wrong. Hello Kasper, great post, thanks! At the very end, you’ve mentioned that there would be no target for products, which is absolutely right, but it souldn’t mess up the analysis as it is messing mine. I am having a hard time to figure out a solution for a similar situation. From what I’ve seen, if you nest the product attribute under the country, you would get very undesirable results. The collection would include every existing product, even those which are totaly unrelated to the country (that is, no sales ever in that place). Anyway, do you know how to overcome this behavior? Ops, sorry, I’ve made a bad character choice and my example was ruined by the html editor… This is what I meant. how to manage the situation in PowerPivot relationships? Looks like PP has got an assumption that two entities are allowed having zero or maximum one relation between. I could find a workaround in creating as many surrogate entities as many relations I need, but I cannot create those surrogate entities in automatic manner based on PP datasource, only manually or with the help of programming. The only way to do this is manually, this feature is not available in PowerPivot v1. We have several Progress Databases running on AIX. The structure of the databases are identical and they represent different divisions of our company. Currently I have an Excel pivot table that points to an Access table that is updated with a union query that combines the data from four databases into one table. Is there a way to create the union query in PowerPivot so I don’t have to use Access? I have seen some examples of union queries for pivot tables and PowerPivot, but they have all been from other Excel files and not from external databases. Thanks for any advice!!! I was wondering if someone can help me understand something with powerpivot. I have two tables that are related with a key field. Table 1 & Table 2. Say in Table 1 I have the Key field and fields: Division, Segment, insurance Line, State, # Sold, # not sold. Anyway, When I filter on Division, Segment, State all the data changes for the fields that are in Table 1 (# sold, # not Sold) but the fields from Table 2 (Score & EMOD) does not change. I would have thought because they are now related by the key field that when I filter on Division & State it would filter the data in Table 2 even though Table 2 does not have Division & State in the data. Am I thinking abou this wrong? I have a simlar situation but I cannot apply your solution because the two fact tables are on a many to many relationship. Do you know how to sort this problem out? Many to Many is a different issue. This is currently not supported directly in PowerPivot. There are many session at conferences you can find online on how to solve this using DAX. Hi Kasper, I have two fact tables (sales and POReceipts) that share all the same dimensions (store, item, supplier, date). In this situation I find that as long as I make my context references to the Dim tables (and not fields in one fact table) there seems to be no reason to aggregate the data into one table. Fields from both tables seem to coexist in the presentation well and calculated fields can accurately pull data from both tables at once. So, is there some benefit in combining this data into one table? Hi Charles, combining tables might make your life easier but if you dont have a real need I would say build a star schema. I have 2 facts table (sales and sales target). Under sales, I have 11 columns with field [Category], [Channel],[Region], [Brand],[SubBrand],[Variants],[Packsize],[Year],[Month],[Sales Qty] and[Sales Amt]. Under Sales target, there are 6 columns with [Region], [Sub-Brand], [Channel],[Year],[Month] and [Sales Target Amt]. I would like to create the relationship by putting [Sales Amt] and [Sales Target] side by side for the pivot table as well as to calculate the achievement %. I have created 2 unique field “=sales[region]&sales[sub-brand]&sales[channel]&sales[year]&sales[month] for sales table whereas “=sales target[region]&sales target[sub-brand]&sales target[channel]&sales target[year]&sales target[month] for target table. Then I created the relationship with “table”:sales and ‘related lookup table”:sales target with unique fields as the columns. However, it seems like doesn’t work at all. I have tried using the existing Connection to connect to the LTE data, then using the Query Editor to combine LTE Data to the TPR data. I even created a sample and verified column count and column names match – still no luck. I was hoping you could help me get this working or point me in the right direction. any help is greatly appreciated. How do I duplicate the first set of requirements (columns hidden, functions etc) and apply the same design to the other data set. ie. LTE – has been set and TPR needs to replicate the same as LTE. I need to calculate #of Days between two dates and be able to handle if close data is null. Field Names: Detected ON, Closed On. IF closed on is null then I need to take the current date (NOw)- Detected ON. What is the proper syntax? I did try days.duration but unsure on how to handle the null value. Would that be Karen from Preston Brooke?! Can you help me emerge through my brain fog?! I think I did it, I was getting too hung up with doing things the proper BI way rather than reality! Throw away all of those unnecessary and long winded spreadsheets with SumIfs sprinkled around like confetti! !